“Queen of Galapagos yachts”, the 90-foot Reina Silvia is designed to carry 12 to 16 passengers through the Galapagos Islands on a cruise that prioritizes comfort and safety with a sense of adventure. The facilities and services aboard this cruise make it a great choice for families, with affordable rates and flexible accommodations for groups. Aboard the Reina Silvia Galapagos cruise, guests can count on comfortable standards and excellent service, in a luxurious yet family-friendly atmosphere. With a variety of double staterooms, the Reina Silvia cruise has several unique features that make it stand out against other Galapagos cruise ships. The Reina Silvia Galapagos cruise sails two 8-day itineraries, each offering guests adventurous excursions to interact with the region’s remarkable flora and fauna. One, the Eastern route, invites visitors to explore nine of the islands in the Galapagos. Witness giant tortoises up close and personal at the Charles Darwin Center upon Santa Cruz Island, snorkel amongst rainbow fish and sea lions on Espanola, hike the picturesque bay on Santa Fe Island, or stop to see the statuesque iguanas basking in the sun upon volcanic rock formations on South Plaza. On the other, the Western route, guests will more intimately explore six of the islands, visiting some of the same islands above, yet swapping stops on Espanola, San Cristobal and Santa Fe for excursions upon the larger Isabela Island and nearby Fernandina. Here, guests will embark on dinghy rides past the striking rocky shores, colorful flamingos, and even reef sharks. Snorkel amongst turtles, rays and tropical fish, and hike along the base of Alcedo Volcano. Whichever route you choose, beautiful adventure awaits you. Aboard the Reina Silvia Galapagos cruise, guests can count on comfortable standards and excellent service, in a luxurious yet family-friendly atmosphere. With a variety of double staterooms, the Reina Silvia cruise has several unique features that make it stand out against other Galapagos cruise ships. One of the most notable: the double rooms that can be converted into triples to accommodate families. Some double rooms are equipped with Pullman-style beds hidden in the bulkhead that staff will be happy to make up when the stateroom is reserved for three people, a wonderfully convenient feature. Below the Pullman-style bed are usually two twin beds, however these can also be made into one king. All staterooms include an ensuite bathroom with a full-size shower, air conditioning, television and DVD player, flush-operated toilets and windows offering ocean views. Up on the Main Deck, you’ll find the indoor salon and dining area, decorated in the same calming whites and creams with elegant hardwood accents to make you feel right at ease. Socialize or unwind in these areas any time of the day, or perhaps indulge in the delicious cuisine surrounded by friends and family. Drinks are served at the bar, and there is even a library with a selection of books and nature films to help guests learn more about the Galapagos. In the evening, tuck in for informative presentations next to the LCD projector, where the naturalist guide will overview the coming excursions and answer any questions. The Main Deck also has a swim platform in the back, and an elegant extended bow pulpit absolutely perfect for whale and dolphin watching. The Reina Silvia cruise travels with her own kayaks as well, always accessible for an impromptu sea adventure. Up on the main deck, guests will love the areas dedicated to unwinding and appreciating the breathtaking surroundings. For a break from the sun, relax in the enclosed lounge and bar. Equipped with sliding windows that offer sophisticated climate control, this is a great place to toast your adventure with drinks served during sunset and Equator crossings. Beside it is a comfortable cushioned lounge, perfect for reading, daydreaming, or even taking a nap beside the nearly 360 degree views. There’s nowhere on the boat that will let you forget what a remarkable natural environment you’re sailing through, but this area will remind you with every glance outside its windows. 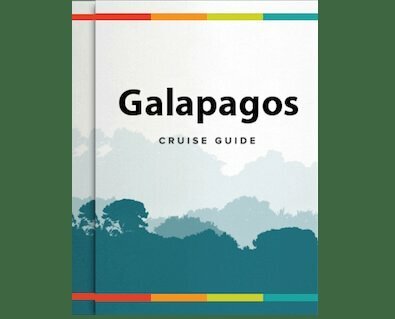 Known for comfort, safety, and well-planned itineraries with quality naturalist guides, the Reina Silvia Galapagos cruise is a great adventure for friends and family.